THINGS ARE HOTTING up at the Crucible. This morning, Matthew Stevens sealed an incredible 13-5 turnaround against fellow Welsh potter Ryan Day, to earn a semi-final spot. Stevens — twice a runner-up at the Crucible — trailed 5-2 at one point yesterday but won 11 frames in a row to advance to the last four, where he’ll face Neil Robertson or Ronnie O’Sullivan tomorrow. Email “Matthew Stevens clinches impressive win over friend Ryan Day”. 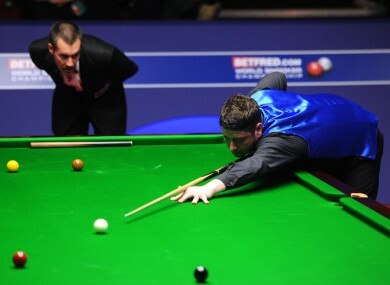 Feedback on “Matthew Stevens clinches impressive win over friend Ryan Day”.